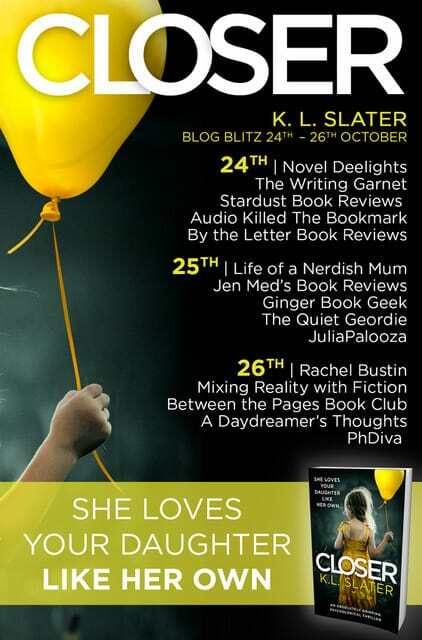 Today it’s turn to be on the blog tour for Closer by KL Slater. The first thing about Closer that made me want to read it was the striking cover. It’s bold, yet dark. Intriguing and mysterious. So was the book as good as the cover? Read on to find out! I will say that Closer starts off pretty slow paced. It gains momentum and towards the end left me on tender hooks. The characters are well thought out and described very well. Closer is a good sit by the fire on a Sunday evening kind of book, once you get past halfway you might not want to put it own. So now I’ve told you the pace of the book, here is a little about the plot. I won’t tell you any spoilers though! Emma and Shaun are separated but still live in the same house to bring up their 10 year old daughter Maisie. When Shaun starts up a relationship with Emma’s boss Joanne things start to go wrong. He moves in with Joanne and her daughter Paige who happens to be the same age as Maisie. But the girls don’t get on. Piper is a spoilt brat who bullies Maisie out of ear shot of Shaun. What’s upsetting to me is that Maisie becomes withdrawn and stops eating. Shaun can’t see anything wrong and thinks Emma is seeing too much into the situation. But when things start happening to Emma, clearly something is amiss. Check out the other blogs on the blog tour. You can find my other book reviews and tours here. *Thanks to Netgalley and Bookouture for my copy, all thoughts and opinions are my own. I agree with you about the cover, if I saw this I would certainly pick it up. 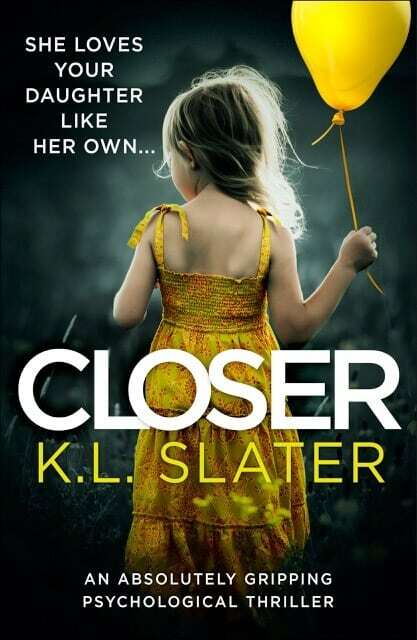 This book sound intriguing, I mainly listen to audio books downloaded from my local library but I have just made an exception and treated myself to the kindle edition of “Closer”. Can’t wait to settle down and read so thanks for the review! Sounds interesting, you certainly didn’t give anything away, i want to read it now! I need to read this. Right now. Does sound a very good read and yes agree the cover is striking and intriguing.